Product #60770 | SKU 22031 | 0.0 (no ratings yet) Thanks for your rating! 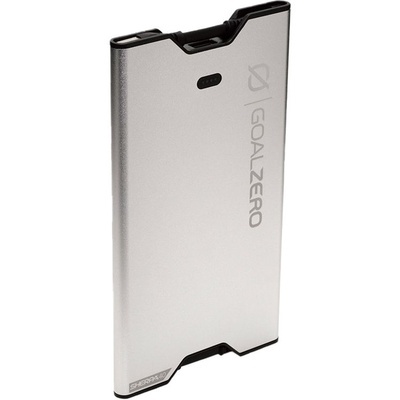 The Goal Zero Sherpa 40 Power Bank (Silver) is slim and powerful with 12,000mAh and 4.8A USB combined outputs, ideal for charging power-hungry devices like tablets. Each Sherpa gives extra life to your essential electronics - phones, tablets, wearables, etc. The new Sherpas feature the latest in thin-pack lithium technology and are handily equipped with the cables you need to charge your devices on-the-go, and includes USB-C, micro USB, and Lightning cables for convenience. On-board cable options include Lightning, micro USB, and USB-C. With no seams to break or crack, the Sherpa’s extruded aluminium body is not only beautiful, it’s durable as well with a premium feel. They also slide easily into any backpack or tablet sleeve.